Our priority is to make Exym EHR as fast as possible, feature-rich, and easy to use, so you can focus on what matters most: getting your job done. We have done this by building an intuitive system that presents information in a logical fashion and allows users to access the data they need with just a few mouse-clicks. It sounds minor, but when you spend as much time as most staff do with their EHR, it dramatically improves your experience. One of the ways we accomplish this is by providing a robust note template builder. In Exym you can build templates that include other system modules, such as diagnosis and goals, that can be edited while you write your note. You can pair notes with services and then add sophisticated billing and workflow logic. Sophistication that your clinical staff never sees — they just add a service, and the system works in the background to take care of note routing, claims validation and audit compliance seamlessly. We always strive to improve our EHR system, whether that means being the first to incorporate new Medi-Cal requirements or offering better reporting tools, we never stop working to provide you with the best system we can. Note templates can include widgets for everyday things like goals and diagnosis, which can be edited directly in the note. 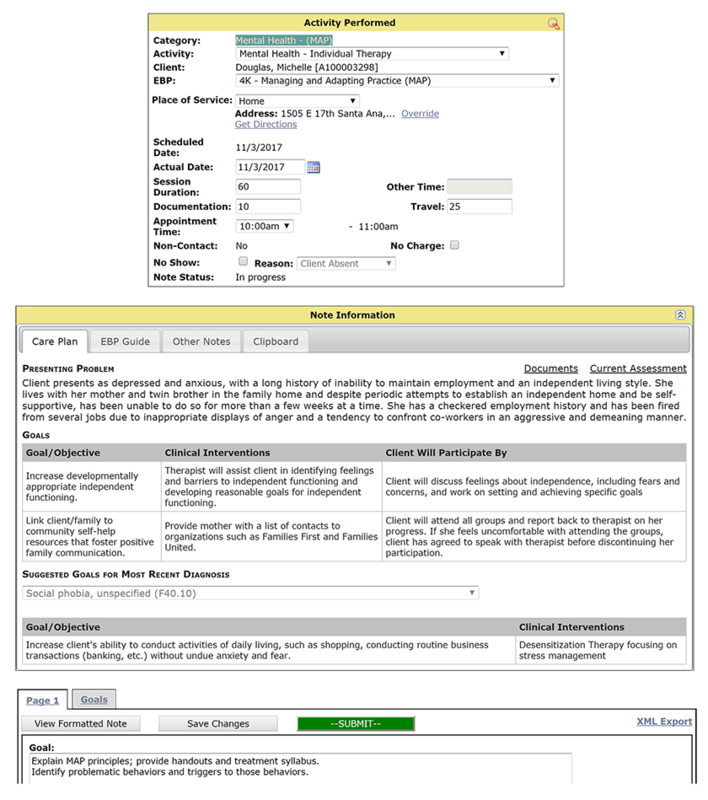 Associate notes with your services, and build billing and workflow logic in them including auto-scheduling notes when status changes, or locking a chart when a particular type of note is not completed. Include signature modules so clients can sign directly on the computer or tablet. Exym does more than just keep track of your appointments and billing. It also provides the ability to reserve therapy rooms, check others' availability, check-in clients at the front desk, even view your Exym calendar in Outlook. For multi-location organizations, you can select different facilities and different rooms within a facility. The schedule shows you which time slots are already taken in a given room, so it's easy to find an available room for your appointment. Exym provides powerful management reports: Billing can be measured in real-time, at whatever intervals you like (daily, weekly, monthly, etc.). You can even set monthly billing goals and compare them to actual performance. Standard reports can be associated with specific activities so that the process of updating activities and creating the reports associated with them is easy and automatic. Time-consuming reports such as weekly status reports are generated from the database in seconds. Outcome measures are easy to capture in Exym. Common public-domain measures such as the CANS, PHQ-9 and GAD-7 are built into the software. The YOQ can be set up to sync electronically. For measures done outside Exym, you can capture scores and track completion. Exym has had customers in production in L.A. Department of Mental Health (DMH) IBHIS since May 2014. As our competitors struggled with the requirements, DMH kept asking Exym to add new organizations. Even after three years almost 60% of the systems connected to IBHIS run on Exym.